Scoring your first international goal is always likely to be memorable and joyful, but that must have been particularly true for Chris Waddle 30 years ago today. A mesmerising run against Turkey ended with him opening the scoring in a 5-0 win as England celebrated World Cup qualification in style, on a night when the nation’s new generation gave great cause for optimism. 1985 was a busy year for Chris Waddle, with the winger earning his first England cap in March in a friendly against the Republic of Ireland. In the summer he moved from Newcastle United to Tottenham Hotspur. And having become established with the England set-up, he netted his first international goal in October on a night of celebration for the nation. Northern Ireland’s win in Romania earlier in the day effectively guaranteed England would be going to Mexico for the World Cup the following summer, given they had a vastly superior goal difference to Romania who at best could only now only finish level on points with them. Even the most pessimistic of Englishmen accepted they were there with two games to spare. 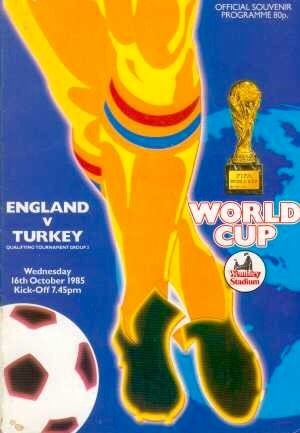 Any concerns that England would now be complacent against Turkey that night were quickly allayed, as Bobby Robson’s side went on the attack from the off against a team they had beaten 8-0 in the away fixture the previous November (in an era before nations such as Andorra and San Marino competed, the Turks were among the lowest ranked nations in Europe). “They still tackled Turkey as if the trophy itself depended on it,” wrote Steve Curry in the Daily Express. Fifteen minutes in England, playing in an unusual combination of red shirts and blue shorts, got their breakthrough through Waddle. The move started with Waddle bringing the ball forward on the left from within his own half. Although his ball to Ray Wilkins was intercepted, it fell back into Waddle’s path just beyond the halfway line. He ran and ran as he cut cross-field, dribbling with his left foot while heading towards the right flank. Waddle then started to move towards the penalty area, riding a tackle and then sidestepping out of the reach of an opponent within the area. He took the ball onto his right foot and scored from an acute angle, the ball going in at the near post despite goalkeeper Yasar Duran getting a hand to it. Waddle had got the goal his lengthy dribble deserved. Manager Robson later recalled that the strike “brought the house down” at Wembley as fans and players celebrated. Chris Waddle is mobbed after scoring his first England goal. During the Football League blackout on television and with English clubs banned from Europe, the match was one of the few TV viewers got to see in the opening months of 1985-86. Martin Tyler, commentating for ITV highlights, was certainly impressed with the strike. “It’s his opening goal for England and it’s arrived in the true Waddle style,” he said as the player was mobbed by team-mates. “On and on he went.” Although the Turkish defending was poor and Waddle was afforded more space than he should have been, it remained a spectacular goal for the sheer extent of the dribble. Waddle scored the standout goal of the night but he was to be upstaged in the headlines by Gary Lineker, who netted his first international hat-trick. A good England team was emerging that looked capable of competing for honours in Mexico the following summer, with new blood such as Lineker, Waddle and Everton’s Gary Stevens complementing the established internationals. Bryan Robson was also on the scoresheet as England led 5-0 with over half an hour left, but he would later go off injured. It was the start of a frustrating injury-plagued few months for the captain and England’s momentum was lost on the night, as the Turks escaped having ‘only’ lost by five goals. But all told this was a good night for England, at a time when there wasn’t a lot else to be proud about with the national game. The following day, there was more cause to smile when UEFA gave England the green light – after a lengthy meeting – to compete in the Euro ’88 qualifiers amid genuine fears they would be expelled due to the hooliganism epidemic. The week had provided a chink of light for English football in a year blighted by tragedy and Waddle’s solo goal was the icing on the cake. Like his singing partner Glenn Hoddle, Waddle (pictured above) made a habit of scoring spectacular goals in his career. His free-kick for Sheffield Wednesday in the 1993 FA Cup semi-final against Sheffield United was one such example. He was more a scorer of great goals rather than a great goalscorer and unfortunately the solo effort against Turkey did not open the floodgates for him. He only managed six goals for his country in 62 caps, the last appearance coming exactly six years later against the same opponents at Wembley (also marking Bryan Robson’s international farewell). But his game was about far more than just scoring. Waddle was a creative player who won plenty of admirers, also proving one of English football’s best exports during his successful spell with French side Marseille. That goal against the Turks in 1985 had underlined the skill and talent he possessed.